I just received an email from American Express offering me a free weekend night certificate valid at any almost any Hilton hotel if I spend $1,000 on my Hilton HHonors American Express card by December 15th. The free weekend night is valid from 12 months of issuance so you have potentially almost all of 2017 to use it if you time the spending right. If you have the card, here is the link to try and see if you are targeted. This is a really good offer – to put it in perspective if I spent the same $1,000 on a 2% cash back card, I would earn $20. So by shifting $1,000 of my spend to this card (which I normally don’t use), I’ll earn a free weekend night at Hilton family hotel. Forgoing $20 bucks for a free hotel night sounds good to me! If you have the offer, I highly recommend enrolling and taking advantage of it. 1. 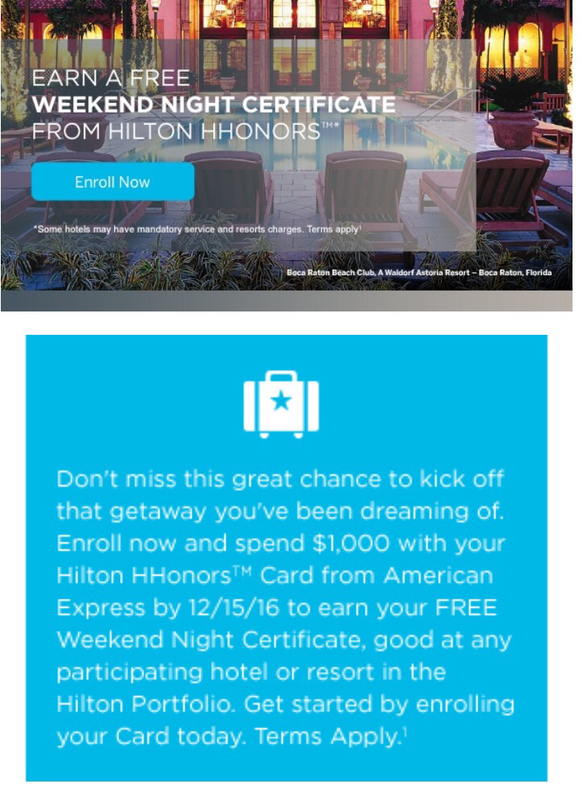 To qualify for the Free One Weekend Night Certificate, you must make $1,000 in purchases with your Hilton HHonors™ Card from American Express now through December 15th 2016. 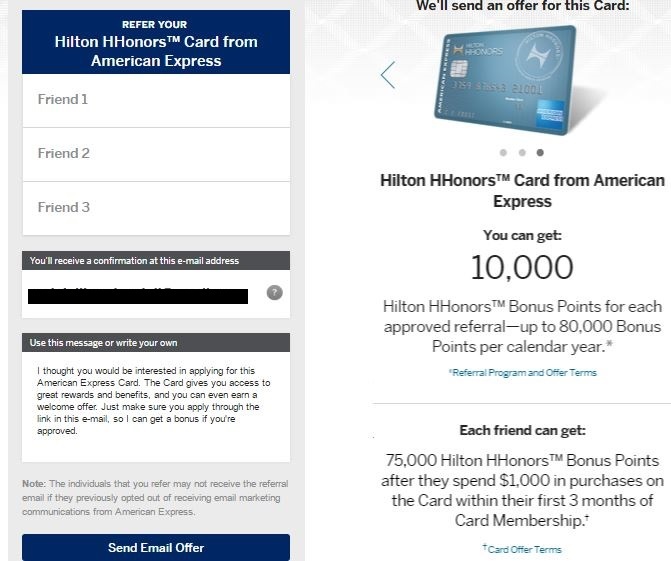 The Free One Weekend Night Certificate will be sent as an email from Hilton to the email address listed on your Hilton HHonors account, 6-8 weeks after you meet the spend requirement. Purchases to meet the spend requirement of this offer do NOT include fees or interest charges, balance transfers, cash advances, purchase of travelers checks, purchase or reloading of prepaid cards, or other cash equivalents. Additional Card Members on your account are not eligible for this offer. A Card Member is only eligible to earn 1 Free Night Certificate during the offer period. To receive the Free One Weekend Night Certificate, your account must not be cancelled or in default at the time of fulfillment. American Express reserves the right to modify or revoke offer at any time. 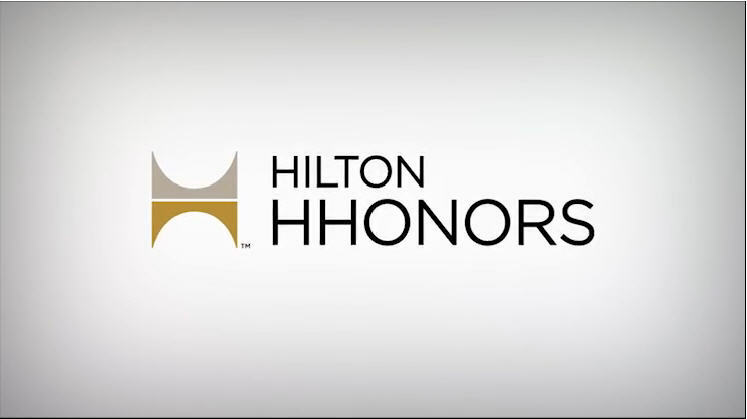 If the HHonors member does not receive the Free One Weekend Night Certificate email within 6-8 weeks after the promotion period ends, the Member should check his/her HHonors account by logging into their profile or by calling 1-800-548-8690 . As a reminder, the Free One Weekend Night Certificate will be delivered in an email from Hilton. To ensure receipt of the certificate, the HHonors member should confirm the correct email address is listed under the Card Member’s HHonors Account file on their profile. The Free One Weekend Night Certificate is valid for one (1) weekend night standard accommodation, double occupancy, subject to availability, at properties in the Hilton HHonors portfolio, excluding those listed at HHonors.com/weekendcertificate. The Free One Weekend Night Certificate applies only to room rate and corresponding taxes, and does not apply to any applicable gratuities, resort fees or incidental charges. The Free One Weekend Night Certificate is valid for 12 months after the date of issuance, as noted on the certificate. You must follow all terms stated on the certificate when redeeming or the certificate may not be honoured. For complete Terms and Conditions that apply to the One Weekend Night Certificate, please refer to the Hilton HHonors Free Night Terms and Conditions. 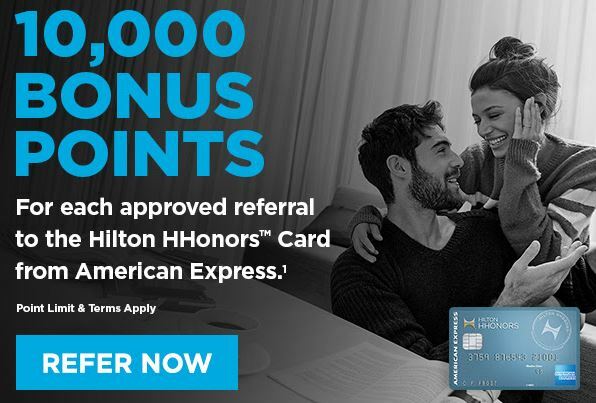 Hilton HHonors™ membership, earning of Points & Miles™ when booking direct and redemption of Points are subject to HHonors Terms and Conditions. © 2016 Hilton Worldwide. Update: There is currently an 80,000 point offer available that you cannot refer others to. A direct link to that offer can be found here. Every so often, I like to take a look at the current refer a friend offers on our credit cards as I’ve unexpectedly found some offers (such as this bonus for the Amex Everyday from last year) that I didn’t know existed. This might not be news to many but today was the first time I noticed an offer on my wife’s American Express account to refer others for the American Express Hilton Surpass credit card. The current refer a friend offer allows the referrer to earn 10,000 Hilton HHonors points per referral up to a maximum of 55,000 points per calendar year. I value Hilton HHonors points at .5 cents each so each referral is worth about $50 based on my valuation. 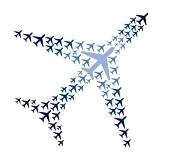 If you are a current cardholder, you can check to see if your account is eligible to refer others at this American Express Refer a Friend link. Now let me be very clear about this – I DO NOT think this offer is worth applying for now as the signup bonus has been as high as 85,000 points in the past on this card. With Amex’s once a lifetime bonus policy, you should try to maximize your earnings by applying for cards only when the offer is at or exceeds the historical best offer on a specific card. However if you are in need of some Hilton points right away and/or the Hilton Gold status for an upcoming stay (to get free breakfast, chance at a better room, etc.) that comes with this card, leave a comment or shoot me an email at ralph@pointscentric.com and I can have my wife refer you.